CARFAX Certified 1 Owner - Fully Serviced - QUALITY CERTIFIED up to 10 YEARS 100,000 MILE WARRANTY This Mercedes-Benz includes: HARMAN/KARDON LOGIC 7 SURROUND SOUND SYSTEM Premium Sound System PALLADIUM SILVER METALLIC HEATED MULTIFUNCTION STEERING WHEEL Steering Wheel Audio Controls Heated Steering Wheel LIGHTING PACKAGE HID headlights Headlights-Auto-Leveling PREMIUM PACKAGE HD Radio Navigation System CD Player AM/FM Stereo Satellite Radio Power Door Locks Keyless Entry Auxiliary Audio Input Hard Disk Drive Media Storage MP3 Player HEATED FRONT BUCKET SEATS (STD) Power Passenger Seat Power Driver Seat Heated Front Seat(s) Driver Adjustable Lumbar Bucket Seats BRUSHED ALUMINUM RUNNING BOARDS Running Boards/Side Steps REARVIEW CAMERA Back-Up Camera RADIO: COMAND SYSTEM W/NAVIGATION HD Radio Navigation System CD Player AM/FM Stereo Auxiliary Audio Input Hard Disk Drive Media Storage MP3 Player *Note - For third party subscriptions or services, please contact the dealer for more information. * Enjoy a higher level of satisfaction with a CARFAX one-owner vehicle. As a compact SUV, this vehicle packs all the performance of a full-size into a package that easily navigates the urban terrain. Pull up in the vehicle and the valet will want to parked on the front row. This Mercedes-Benz GLE is the vehicle others dream to own. Don't miss your chance to make it your new ride. Hit the gas pedal and put the engine power to all four wheels. With AWD, you'll have the greater performance right off the line, everytime you drive. One of the best things about this Mercedes-Benz GLE is that it has low, low mileage. It's ready for you to truly break it in. Enjoy the drive without worrying about directions thanks to the built-in navigation system. This vehicle comes with an extra bonus: past service records are included. This pre-owned Mercedes-Benz GLE looks like new with a clean interior that's been well-kept. There should be no doubt in your mind about purchasing this 2016 GLE GLE 350. This lightly-used vehicle is still covered by the Mercedes-Benz factory warranty. Fast, yet nimble, this highly refined automobile will turn heads wherever you go, provided of course, they even see you. Treat yourself to a wonderful driving experience in this wel- optioned Mercedes-Benz GLE GLE 350. Equipped with the latest in driver comforts, this Mercedes-Benz is the benchmark of modern automotive engineering. Added comfort with contemporary style is the leather interior to heighten the quality and craftsmanship for the Mercedes-Benz GLE Tires can be an expensive maintenance item. Luckily, this vehicle's tires are newly installed, so you've got miles and miles to go before you need to replace them. The paint on this car has no serious defects, blemishes, scratches or scrapes. If you're looking for a one-of-a-kind automobile, look no further. Equipped with upgraded wheels, this Mercedes-Benz GLE is stunning to see driving down the street. More information about the 2016 Mercedes-Benz GLE: The GLE is a mid-sized luxury SUV that competes with vehicles such as the BMW X5 and the Audi Q7. Starting at around $52,000, the GLE comes in a large variety of different flavors, offering everything from a relatively fuel efficient diesel, to a 500+ horsepower. Quality lives up to the usual Mercedes high standards with doors that close with a satisfying clunk and a general feeling of vault-like security. It all goes towards giving the GLE the luxurious look and feel that Mercedes is well renowned for. This model sets itself apart with available coupe body style, ridiculous horsepower when properly optioned, available diesel engine, Attractive packaging, all-wheel drive, and luxurious amenities No Credit / Bad Credit / No Paystubs, No problem !! ! All Approved ! Everyone drives ! CLEAN, GORGEOUS, LOW MILES, SHOWROOM CONDITION. CALL NOW QUALITY CERTIFIED up to 10 YEARS 100,000 MILE WARRANTY , To Certify a vehicle, there will be an additional cost for Certification. CALL NOW For details. STUNNING AGGRESSIVE LOOK ON THIS BEAUTIFUL--Call today to schedule a test drive... Good Credit/Bad Credit/No problem!!!! Get paid cash? No problem!! 100% Credit Approval with interest rates starting at 2.49% for qualified customers, our rates will not be beaten. We price our cars at wholesale price to guarantee the best deals for our customers. Our inventory moves quick, please call to confirm the availability of the vehicle of your interest Springfield location 973-564-0112. This vehicle is located at our SPRINGFIELD location. Come visit our new showroom in Springfield NJ. 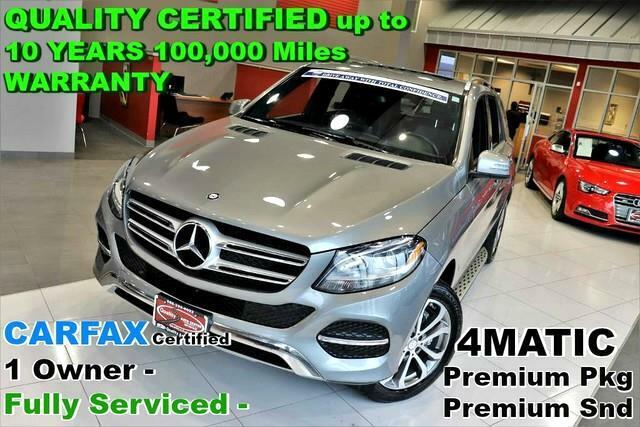 Quality Auto Center is excited to offer this 2016 Mercedes-Benz GLE. Off-road or on the street, this Mercedes-Benz GLE GLE 350 handles with ease. Quality and prestige abound with this Mercedes-Benz GLE. Enjoy the grip and control of AWD performance in this nicely equipped Mercedes-Benz GLE. With less than 45,335mi on this Mercedes-Benz GLE, you'll appreciate the practically showroom newness of this vehicle. More information about the 2016 Mercedes-Benz GLE: The GLE is a mid-sized luxury SUV that competes with vehicles such as the BMW X5 and the Audi Q7. Starting at around $52,000, the GLE comes in a large variety of different flavors, offering everything from a relatively fuel efficient diesel, to a 500+ horsepower. Quality lives up to the usual Mercedes high standards with doors that close with a satisfying clunk and a general feeling of vault-like security. It all goes towards giving the GLE the luxurious look and feel that Mercedes is well renowned for. Strengths of this model include available coupe body style, ridiculous horsepower when properly optioned, available diesel engine, Attractive packaging, all-wheel drive, and luxurious amenities No Credit / Bad Credit / No Paystubs, No problem !! ! All Approved ! Everyone drives ! CLEAN, GORGEOUS, LOW MILES, SHOWROOM CONDITION. CALL NOW QUALITY CERTIFIED up to 10 YEARS 100,000 MILE WARRANTY , To Certify a vehicle, there will be an additional cost for Certification. CALL NOW For details. STUNNING AGGRESSIVE LOOK ON THIS BEAUTIFUL--Call today to schedule a test drive... Good Credit/Bad Credit/No problem!!!! Get paid cash? No problem!! 100% Credit Approval with interest rates starting at 2.49% for qualified customers, our rates will not be beaten. We price our cars at wholesale price to guarantee the best deals for our customers. Our inventory moves quick, please call to confirm the availability of the vehicle of your interest Springfield location 973-564-0112. This vehicle is located at our SPRINGFIELD location. Come visit our new showroom in Springfield NJ.